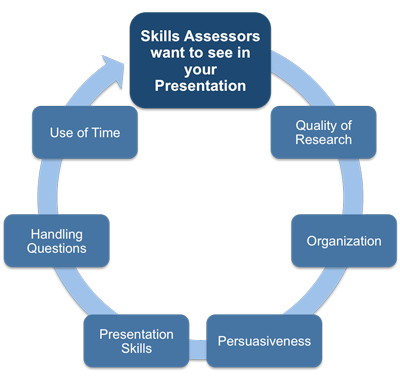 What is an Assessment Centre Presentation Exercise? 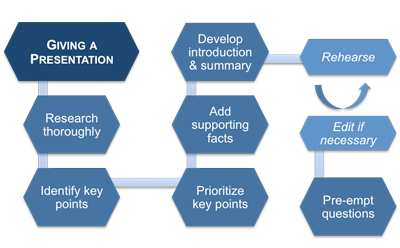 What is a Presentation Exercise? These presentations need to be kept fairly short as the same assessors will observe all of the candidates to make sure that the assessment is fair. You will be given a topic or possibly a choice of topics in advance and will also be told the duration of the presentation, often around ten minutes with five minutes at the end for questions. You can also expect to receive a list of the presentation equipment that is available, usually an OHP. You will need to research the topic carefully. Make sure that your sources are all credible and up to date. The internet is probably the easiest way to research a topic but remember to check any information that you want to use for accuracy and currency. Having gathered all of the facts you need to make your presentation, you will need to put them into some kind of order. The best way to do this is to use cards, about 3” by 5” is ideal. Write one fact on each card, spread them out and then try to sort them in the most appropriate order. It is best to put the most important facts first and avoid trying to get too much information across in the limited time that you have. If the presentation is scheduled to last for ten minutes then you will need to allow one minute at the beginning to introduce yourself and the topic and one minute at the end to summarize your arguments. This means that you only have 8 minutes to get your points across. You may therefore need to discard some of the less important information. You need to structure your delivery to ensure that your ideas are well organized, logical and convincing. The best way to do this is to support each point that you want to get across with just enough information, before moving on to the next point. Again, you can use cards for this. Write the ‘point’ at the top and summarize the supporting information underneath it. You should end up with between 5 and 10 cards for a ten minute presentation. The only acceptable way to make a presentation is to speak naturally using cue cards to prompt you. You must not simply read a pre-prepared script – this will not be acceptable. In order to be able to present in this way you need to rehearse the whole presentation at least three times. This will enable you to refine your cue cards so that they hold the minimum amount of information needed to prompt you and you will not be tempted to just read out your notes. Remember to speak at a steady pace and with clarity so that you can be heard. Keep eye contact with the observers and try not to refer to your cue cards other than when strictly necessary. At the end of your presentation the observers will ask a few questions. Think about the sort of things that might be asked and try to have good answers ready. If you don’t understand the question don’t be afraid to ask for clarification and if you don’t know the answer, then be honest. If the assessor disagrees with one of your points then you will be expected to defend your reasoning but remember to be polite and constructive. The assessors will also be checking that you stay within the allocated time frame. This is another reason why you must rehearse your delivery. Even experienced presenters cannot make an accurate measurement of how long a presentation will take to deliver just by looking at their notes. There is no excuse for overrunning your time slot or for running out of material when you have been told how long your presentation should take. The presentation exercise is a great opportunity for you to stand out from the crowd. Giving a presentation offers you a much better platform than is normally available when simply answering an interviewer's questions. You also have far more control in this exercise than in any of the others. Firstly, you don’t need to consider other participants, as you would in a group discussion or role-play exercise. Secondly, you do have control over how you present your given topic or theme. So if you are asked to give a presentation, be prepared to make the most of this opportunity to show what you can do and have to offer. How you organise the material. How you actually present it. How you handle and answer questions. Do you sound as though you really want to be there delivering the message? This aspect of job selection is often overlooked by candidates but most employers want someone who has a genuine enthusiasm for what they do. You need to deliver your presentation with a certain amount of passion – don’t go over the top but you must engage the audience of assessors. They may be listening to a whole series of presentations on the same or similar topics so don’t underestimate how much energy you need to put in if you are going to capture and hold their attention. Try to demonstrate that you can add value beyond that which the employer expects from the role. This is easier in some presentations than others, it depends on the topic you’re given, but it is often this ‘added value’ that marks out the successful candidates. You are given a topic in advance of the assessment centre and told how long a presentation you need to prepare. You will also be told what visual aids you can use and whether you can use PowerPoint. If your assessment centre spans two days, then the preparation can sometimes be set as an exercise at the end of the first day. The idea being that you work on it in the evening and give the presentation the following day. These presentations are usually scheduled to last at least 30 minutes. You are given a topic on the day along with some relevant data and a set time, typically 30 minutes to prepare. The duration of this type of presentation is usually 10-20 minutes. The presentation can be linked to other exercises, usually the group discussion. In this instance each candidate is expected to make a presentation detailing the group’s findings or conclusions. The duration of this type of presentation is usually 10-20 minutes. Whichever format a presentation is going to take you can give yourself a huge advantage by knowing how to prepare properly. It does not matter whether the preparation time is several weeks or half an hour, if you have a system that you have practiced using you will have far more chance of success than a candidate who just improvises and hopes for the best. This also demonstrates another competency to the assessor how well you plan and organise your presentation. For example, depending on the nature and topic of your presentation you need to show how your role contributes to the overall objective i.e. implementation of a new system or procedure into your department. You will also need to illustrate how you plan to communicate and monitor progress to all involved parties in your presentation. IN some instances you may have to also demonstrate another competency - how you will manage resources. The six-point plan below is both logical and flexible. It is designed to make sure that you don’t waste time thinking about what to do, and that you spend whatever preparation time you have as efficiently as possible. There are some qualities that a coherent presentation simply must have and by following this plan you can be confident that your presentation will have these qualities. This plan will work just as well whether you have three weeks or thirty minutes to prepare. Obviously, with only half an hour to prepare you really can’t afford to waste any time and using the six-point plan below will ensure that you make the best use of every minute that you have. Each of these stages is described in detail in the 'Assessment Centre' eBook.